Lemon Crostata, Holiday Sugar Cookies and a Double Holiday Giveaway! Thanksgiving is yet to be a faded memory and Chanukah is already welcoming us this coming Wednesday. Before I embark on a weeklong Israeli, American, cider, baked and fried doughnut making extravaganza, let's backtrack. This past Thanksgiving I made a classic Lemon Crostata from Domenica Marchetti's Big Night In. I was at awe at the flavor intensity of this no fuss lemon curd. It paired beautifully with the sweet pastry (pasta frolla) crust. The remainder of the dough I used for holiday sugar cookies, sprinkled the dough with naturally dyed sugars, some finicky kids as well as the adults could not stop munching on those. 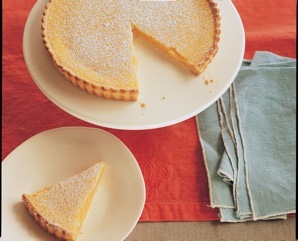 These both are classic elegant lemon dessert and cookies for every day and the holidays. To show the versatility of this dough, Lora @cakeduchess, a wonderful baker and a great twitter friend, put another twist to this wonderful sweet pastry dough and made chocolate hazelnut cookies you can find here. Both Lora and I are doing Domenica's Big Night In giveaway. 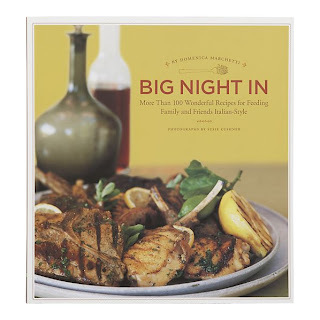 We thought to publish a double giveaway simultaneously to double your chances at winning this wonderful Big Night In cookbook and enjoy it for the Holidays. Please visit Lora's post and enter your comment here as well for doubling your chances. Domenica Marchetti, a local cookbook author with a national reputation is a lovely lady with many accolades under her belt. I believe she is Ivy League educated and the author of Big Night In . This Italian treasure of a book will be a fixture in your kitchen. Domenica also has two books coming out in 2011, The Glorious Pasta of Italy (Chronicle) in the spring, and a book on rustic Italian cooking (Williams-Sonoma) in the fall. Big Night In was named one of the 25 best cookbooks of the year by the editors of Food and Wine. Domenica is a contributor to many magazines and newspapers including the Washington Post Food Section. You can find her full bio here. 5. Leave a comment on this post! You are encouraged to share a comment about Domenica's Big Night In or any other thoughts. 6. If you RT or post on your Facebook page this giveaway post link, you get an additional entry. Please drop me an additional comment on this post saying that you did so. 7. To get an additional chance in the giveaway, become a "follower" of 'Food Wanderings' blog. 8. Drawing will be done randomly from all comments recorded by Sunday, December 5 by midnight and lucky winner-will announced on Monday, December 6. 10. Don't forget to go to Lora's site and enter the giveaway there. dough and do not overwork it; too much flour and handling will yield a tough dough. and process until the dough just begins to come together. with cooking a lemon curd on the stove top, no risk of curdling. tart pan in the refrigerator for 30 minutes. aluminum foil (or 2 pieces of regular aluminum foil to create a double thickness). the foil and the beans and bake for 15 more minutes, until the crust is light golden. stars in the oven and bake for 10 to 12 minutes, until the edges are lightly browned. Transfer the cut-outs to a rack to cool. cut-outs as you please on top of the tart and serve. slightly cooler before rolling it out. Your cookies are so pretty! I've never tried sprinkling with sugars or other decorations before. first of all the lemon crostata look divine!!! I just retweeted this out under CookUnderwriter on Twitter. Both the Lemon crostata and sugar cookies look so delicious I am going to have to make that crostata. I like foodwanderings on Facebook! I love reading Domenica's articles in the Washington Post and would LOVE to own this book. Proud Italian. Thanks!!! By the way your case of pickled beets was shipped out from Aunt Nellies this week to the Foodbank as requested. This lemon crostata is right up my alley : ) And Domenica is fantabulous! follow you any closer than Twitter and I'll be at ur front door. I WANT THIS BOOK!!! you know i'm in love with all things Italy (including you!) and the movie 'Big Night' is one of my favorite movies ever!! PICK ME, PICK ME!!! just tweeted about ur generosity. Give Give Give! Shulie, thank you for the lovely words & for featuring my book. I'm so honored! Look forward to meeting you in person, hopefully soon. I follow @domenicacooks on Twitter... and I'm so glad I am! And I'm DYING to try out that lemon crostata! Looks incredible! Tweeted the contest with a link. I want this cookbook! It looks great! What a beautiful looking cookbook! I dream of going to Italy some day, but until then I keep my dreams fueled with beautiful, rustic, tasty, Italian dishes. Adding the Lemon Crostata to the list is a perfect fit! I already "like" you on Facebook. I LIKE YOU ON FB TOO!!! I would love to try some of these recipes! I am so excited to have found a new blog to follow thanks to the Cake Duchess! Sugar cookies remind me of childhood with my mama making lots of them for us kids to sit around the table with frosting down to our elbows and an overload of sprinkles on our cookies! I would also love to win the cookbook as well. I also posted the link for your giveaway on my Facebook page! OMG Ken is too funny! And I follow you on twitter and facebook and I'd follow you home if I could! Great book! And a lemon crostata? Mmmmm... heaven! Oh I also followed domenica cooks! I have to try this lemon crostata - the more I look at it the more I need to taste it! Beautiful cookies, too. Happy Hanukkah! How do I subscribe by email? I entered at Lora's site. Thanks for sharing all those wonderful recipes. Hello, I just stopped by from visiting Lora...You have a lovely site here and I would be happy to follow you. I just did a crostata for Daring Bakers, abd couldn't get enough of it. Did some more dough 2 days ago for tart bases...and now this one. WOW... must be a wonderful book this! Would you include me in your giveaway if I have a US address? Thank you! Mmm, that tart looks so good. I have a tart pan I purchased in May that I STILL haven't used... haven't made a tart yet, ever! I am following DC on Twitter. I am also following you on Twitter! Sounds like a fantastic cookbook. And what a great idea that you and Lora used the same dough to make 2 different things.